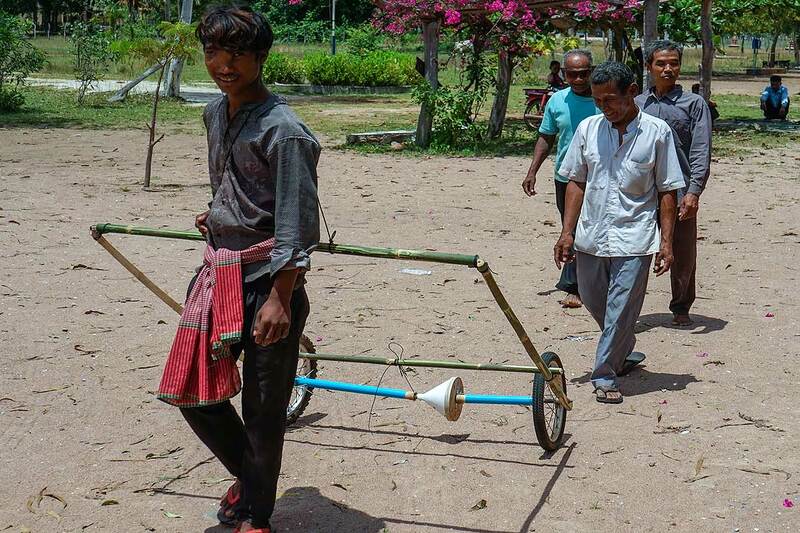 Prototype rice seeding equipment for the visually impaired. A Massey University lecturer is working with communities in rural Cambodia to help create community-led farming technologies for people with disabilities. Lecturer in product design at the Schoolof Engineering and Advanced Technology, Andrew Drain says the project, part of his PhDresearch, aims to help the community overcome challenges using a collaborative design process. “The majority of Cambodians live in rural areas, which makes small scale farming a huge part of their daily lives. The tools they use are basic by western standards, but they are an incredibly resourceful people who manage astoundingly well with what they have. Mr Drain has just returned from a small village in the Kampong Chhnang Province, where he has been running workshops from a local primary school. These workshops are focused on collaborative problem scoping, idea generation, prototyping of that idea and finally the field-testing of equipment they have created. The groups, including land mine victims, wheelchair users, visually impaired and elderly participants, develop concepts practical ideas during eight workshops, which are run across three months. Concepts Ideas include rice seeding equipment for the visually-impaired, accessible chicken coops for blind users and mobility devices for walking through flooded rice fields. “The aim of this project is to use the time we have in these communities to help them learn proven design processes. We do this through practical workshops that engage them to solve their own issues in a systematic way, so that once we are gone they can replicate the process and solve the next issues they face,” Mr Drain says. 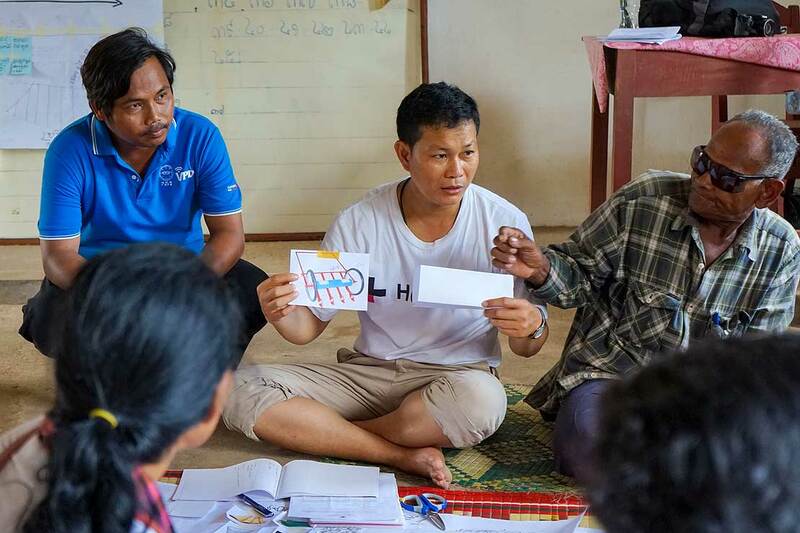 “We also aim to gain insights about people with disabilities that can be used to help a large number of individuals around Cambodia in the future. The project seeks to do this by using co-design, a design process where community collaboration is incorporated at every stage of the design process. “Co-design results in a product which is fit for the community as it was designed by those who will actually use and maintain it, by the many people who actually understand the problems and opportunities,” Mr Drain says. Initial results suggest that a focus on collaboration and building local creativity can result in innovative, appropriate solutions and high levels of community motivation and engagement with one another throughout the project. “We are not the first engineers to use co-design in a developing country, however previously the process has proved tricky and slow because of the difficulties some communities have with creative thinking, expressing opinions and understanding western design practices. The project is in partnership with Agile Development Group, Light for The World Cambodia and Engineers Without Borders Australia and is funded by The New Zealand Aid Programme and Massey University. Massey’s Major leader, Dr Aruna Shekar, along with Professor Nigel Grigg, is supervising Mr Drain’s PhD research. Dr Shekar leads the Engineering and Innovation Management (EIM) major within the Bachelor of Engineering, which is directed at those who aspire to be engineers and want to design creative solutions to real-world issues. The solid grounding in engineering together with applied learning prepare students for a wide range of inspiring applications and rewarding experiences, she says. Mr Drain gave a presentation about his work to the Massey finals of the 2017 Three Minute Thesis (3MT) and announced as the runner-up. Mr Drain is also a member of the Asia New Zealand Foundation Leadership Network.